Happy New Year to the Currie Star family. I hope you enjoyed your festive break and everyone is raring to go in 2018 ! I have been warned by our new Editor to keep my comments brief.....which is never easy when I’m talking about Currie Star but I will try my best!! The Committee have engaged with the Council regarding the possibility of a long term lease away from Kingsknowe. The process will likely take about 18 months but there are a lot of hurdles to jump before we will know if we have been successful. If phase one is achieved, phase 2 will focus on funding for pitch development. I’m sure we have many professional parents in the Club whose services we will be calling for in future months so please don't be shy. We don’t want to be paying for services we can otherwise source from within the Club for FREE! There have been a few boys out with senior clubs in recent months and a couple signed pro youth contracts, which is fantastic for the boys. We’ve probably had more boys asked by senior clubs in the last few years than ever since I’ve been involved with the club. Great credit must be given to our wonderful partners at Play2Learn and all their coaches in addition to our own coaches. A process is now in place where our coaches are running sessions and receiving feedback from Dave Upton which is proving hugely beneficial and putting down good foundations for future years. Very well done to everyone and best of luck to the players. Finally, the next Gothia trip is scheduled for 2019 but I know many of the teams are already fundraising, which is great to see. I have raved before many times about how good the whole Gothia experience is, which is corroborated by the teams who have now attended. I would encourage as many of the year groups as possible to attend at least once so their boys have an experience they will never forget. All the best in blue and white!! 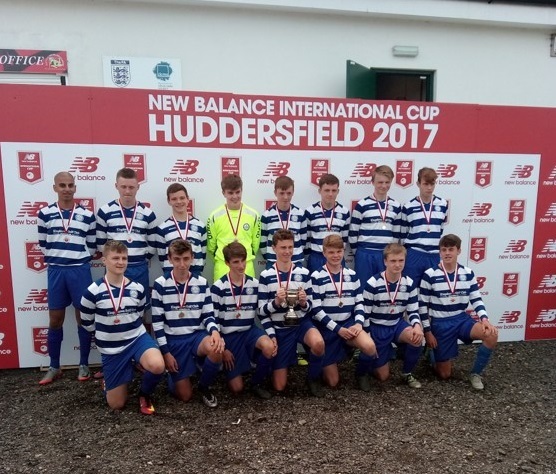 We won the 2nd Division league championship, the league cup and finally the New Balance Huddersfield International tournament (photo attached). The boys have now moved up to the top division and are holding their own. Whilst the pace of the game is definitely faster and more physical the boys are adjusting to it. The focus is still developing them to prepare them for moving up to the Heriot Watt University team in a year or two. Keep working hard boys. We have not fared so well in Cup competitions, coming up against 1st Division teams in these tough games but our form has been better in the league. We are currently sitting in second place having lost our last 2 games narrowly against those teams we feel are the biggest competition for us but both games were away from home and on poor quality surfaces. We are confident that when we get these two teams back to Malleny for the return fixture on our great surface there we will have a better outcome. We have a trip to Manchester to look forward to at Easter and will turn our attention to preparing for that when everyone is back after the holidays. Won’t quite match our trip to Rimini Italy last Easter but one which I’m sure the boys will enjoy nevertheless. We wish all Currie Star a Happy New Year and hope everyone has a successful 2018. Thanks to everyone who donated their old Currie Star kit this Autumn. In October this year a group of pupils from George Watson’s College visited Malawi to help with local educational and building projects. They brought with them a donation of old strips which were gratefully received by the local children and teenagers. The visit ended with a challenge ... a mixed football and netball match against teams in the rural village of Mulanje, a few miles from Mount Mulanje. 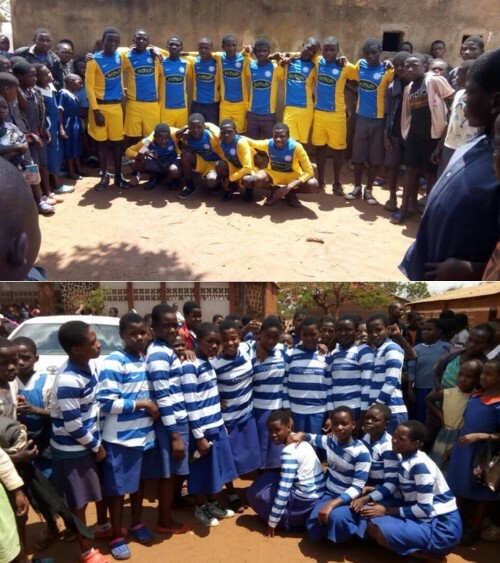 This year the locals were fortunate to receive enough of the same strips to field a whole team, and even though they were much younger than the Watsons pupils managed to secure a draw in the football and won by miles in the netball game! We plan to make another collection of old football kit and boots next year so please look out for the collection box at Kingsknowe. More details about Malawi 2018 collection to follow. The squad are competing at the top end of the table. We've not had much luck with injuries which have left us with a short squad for some matches but on the whole the boys have done well. Currie Star 16s Colts - head coach Jamie Faichney is no longer with the club - therefore the colts are looking for someone to come in and help run the team - if anyone knows anyone who'd be interested please email curriestar2002@gmail.com. Davie comes with a wealth of experience, previously with Livingston Pro Youth. He is already a hit with the team, who are sitting 5th in the league with a few games in hand. We have only lost 1 game from our last 4 games in 2017. 2018 starts with the League Cup campaign, a few boys have taken a step back from football so we will be looking to strengthen the squad in the New Year with at least 14 games to play until the end of the season. 2003s would like to thank Kelly Marjoribanks, Dean and Elaine Sutherland who regularly give up their time to support the boys fundraising, providing drinks and snacks at games. So far they've raised over £400 to help towards a team outings. The squad have been attending boxing fitness classes during the colder nights, this has been a great experience to see the boys working hard in the gym and improving their fitness. Team has now played 8 and won 8 in SERYFA Division 4, but sit 4th in the league due to having played fewer games than those around us. We’ve had a good cup run in the Ian Mackay Cup and are due to play Edinburgh United in the semi-final having beaten our closest league challengers, Civil Service Strollers, 5 – 3 in a hard fought and tense quarter final!! Over the past 6-8 week period we’ve really come on with some notable performances incl turning a 5:1 league defeat to the "noisy neighbours" (Currie FC) into a 3:1 cup win. Hard work on stamina building at training is paying off and new signings have settled in well. We've done a lot of work on two touch mini games to promote off the ball support but could do with improving our finishing as in games we've lost, we've had many more shooting chances than the opposition. 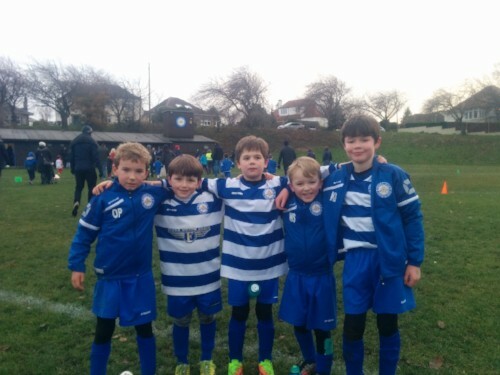 A number of the boys have had growth spurts this season and are putting the extra muscle to good use on the pitch. Despite this, we've only picked up about 3-4 yellow cards and no reds so well done boys (and coaches - no cautions for them either). As we look ahead, our remaining league matches are all winnable and we're in a couple of cup semis. The next will be the Charles Kilvin Cup against the Civil Service Strollers who put our 2004 stable mates out in the last round. Let's see if we can turn that 5:3 league defeat into another cup win. Big thanks to parents for helping to get all players to trainings and matches on time and to two outfield players who are each taking a half between the sticks in most games following the departure of our long time keeper. If there are any 2004 keepers interested in a trial, let us know. And finally thanks to coach Ed Hutchinson who is hanging up his boots after almost 6 years with the club. Ed has been a great asset and remains a good friend, despite all that snoring in Gothenburg in July! Autumn saw the start of first 11-a-side season, in Division 2, and a number of cups with a tough opening game away to Hutchie Vale. The coaches cannot fault the effort of all the boys and almost all the games have been highly competitive. Up to end of last year the team has played 17 fixtures, won 6, drawn 2 and lost 9, and we sit comfortably in mid-table as almost all our wins have come in the league, following some tough draws in the cup competitions. One pleasing aspect of our game is on more than one occasion we’ve turned a defeat into a victory or recorded a much improved performance. This indicates that the boys are moving in the right direction and we’re looking forward to the season run-in. The league match against Lasswade Thistle (away) was filmed by the SYFA and the DVD made interesting viewing, particularly coach Hans’ insightful interview at the end…. worth a watch. We are looking forward to seeing continued progress as the season continues and the boys settle into their preferred playing positions. The race for the Golden Boot is now looking like a one horse affair although the goals have been spread around the team quite nicely : Finlay -12, Harry -6, Jack -6, Max – 6, Alastair – 6, Archie -6. The start of the season brought some mixed results but the boys settled into the flow of the game. Just before the festive break we had enjoyed a winning streak of 8 games in a row which meant that the team are placed well in the league but also managed to get into two cup semi finals. Our last game in 2017 was a thriller semi final against Haddington which was 1-1 after extra-time and unfortunately we lost out during the lottery that is penalties. However, the boys are playing really well as a team and we still have our second semi final in January. 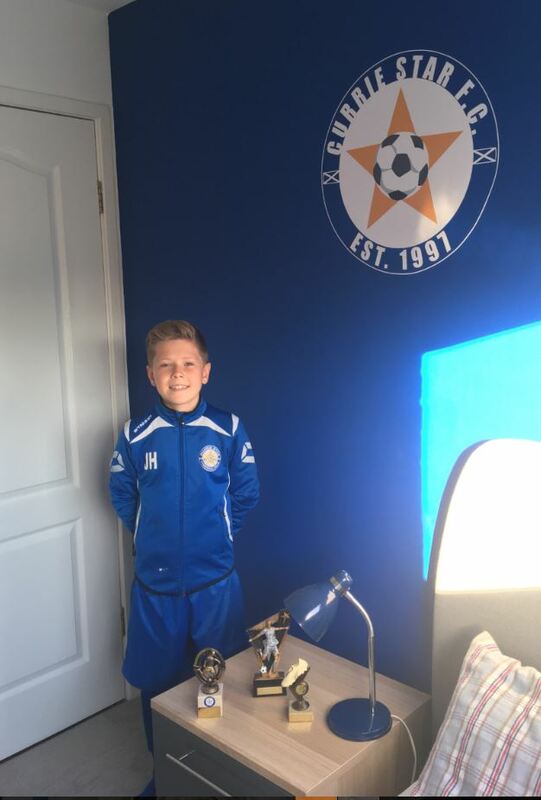 James Hunt from 2006s has only gone and got his bedroom painted in the Currie Star colours and logo. Now that’s a boy with a big future at the club!! We’ve played over one 100 matches across six teams, including summer tournaments in Newtongrange, Livingston and Fife in which the boys acquitted themselves very well. One of the most memorable matches came in December when Dunfermline Athletic boys brought their undefeated team to Saughton for a friendly against a combined Pele/Maradona team. All our boys played extremely well, particularly Reece Forbes, who was just unplayable, and Danny Hyslop, who was brilliant in goals for us. We beat them comprehensively and their coach was good enough to send us some feedback saying that we were the best team they had faced by some distance. On the playing front, numbers appear to have peaked at 64 with Adam Phayre still on trial at Hibs October saw our first visit to Easter Road for the Hibs v Aberdeen match, we took 16 boys and the day included a tour of the stadium, a training session with the Hibs coaches, seats to watch the match and the chance to play on the pitch at half time. We repeated the experience in December, this time we took 36 boys for the Hibs v Celtic game and it was a great experience for the boys to play on the pitch in front of 20,000 people. For our Xmas function we took 50 of the boys to Delta Force paintball at Dalmahoy for a whole day. The boys absolutely loved it despite firing thousands of Paintballs at each other over the course of 6 hours, thankfully there were no injuries. Finally, our new strips and tracksuits have arrived. 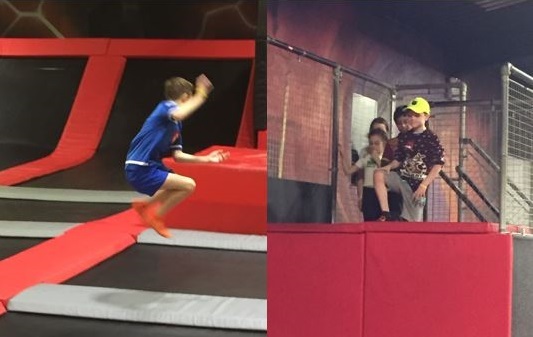 A great time was had by all by ending the year with a fun filled bouncing session at Ryze. We’re looking forward to getting back to training and joining in with the winter football. 2008 U10’s – put em up! It’s been a busy few months for the 2008 group. In November we took the boys on their first ‘international tour’ – as we took a trip to Newcastle, playing some challenge matches against Newcastle East End Boys Club, before heading to St James Park to watch Newcastle vs Bournemouth. The kids had a great time. The parents and coaches survived. Even better, all the boys made it back too! Just before Christmas we had our end of year party at Xtreme laser tag. A few hours of shooting each other as part of our team building! Not sure how we will top it next year. The coaching has also been great – Archie from 2001 has been helping out for the last few weeks, introducing the boys to the game of ‘21’ at training, and managing one of the squads on match days. The boys have loved him, and the improvement in the results from the Bayern team has been phenomenal. I’m just hoping he comes back in the new year! We continue to attract loads of new players and are having to implement a waiting list as we cannot keep up with demand. We finished Super 4s at the end of November. It has been a great 1st year for the lads, with a squad of 42 and regularly fielding 6 teams on a Sunday. We have attended festivals at Tynecastle and Musselburgh Windsor. Probably the highlight was our end of season festival we hosted. We invited Linlithgow Rose, Giffnock Boys Club, Spartans and Edinburgh South to fun 4s festival at Dovecot Park. We ran 9x7 minute games and hosted 20 teams, catering for over 100 boys. General feedback was very positive from all the clubs and parents in attendance, and has helped us make new friends further west! This will lead to return festivals and invites as we progress, and does our broader rep no harm. So onwards and upwards for 5 a side next year! This is the best time to join the club as our membership year runs from 1 January to 31 December. Join now to maximise your membership. It’s easy to join too. Just download and return the application form to the office, Pro Shop or email Jacqui here. Click here to download the form. All the information you need is on the form. If you need any further information please email here. Any person with a family connection to Currie Star will receive a 10% discount if you mention CSFC when you return your application form. 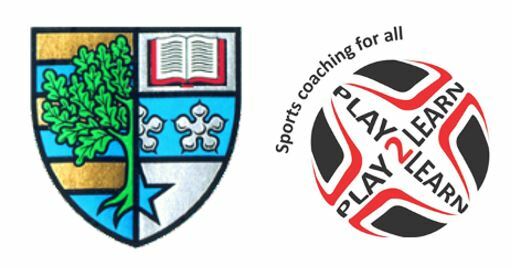 Thanks to Play2Learn and Heriot Watt University who continue to support the club.